PAMP Suisse Silver carries the .999 mark guaranteeing each bars pure silver content which is common among PAMP Suisse’s products. 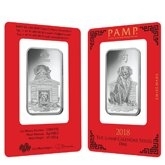 PAMP Silver bars are a very popular acquisition among silver bar collectors and investors, as the company is credited for minting the most exquisite and highly favored silver bars in the world. Each PAMP Suisse silver bar is manufactured according to the highest quality standards in the precious metal industry. Bullion Exchanges offers you a large collection of these impressive PAMP Suisse silver bars for sale, with detailed designs and varying sizes available. 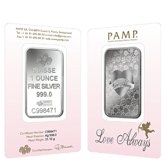 The PAMP Suisse silver bar collection includes the Lunar Series, the famous Lady Fortuna, various religious-themed silver bars and several other designs, such as Rosa, Love Always and True Happiness. PAMP Suisse is a worldwide leading Mint and marketer of precious metals. The company was founded in 1977 in Ticino, Switzerland, located in the southernmost part of this incredibly beautiful country. Besides manufacturing stunning silver bars, PAMP Suisse is also known as the most popular mint specialized in producing platinum and gold bullion products, along with gold and silver blanks. These blanks are sent to national mints which turn them into national currency. Since PAMP Suisse is trusted by national governments and authorities all over the world, the company is also highly trusted by individual investors and collectors as a leading brand in operating state-of-the-art precious metals. The company is also known for introducing many innovative processes and products in minting precious metals, like incorporating holographic features as a measure against counterfeiting. 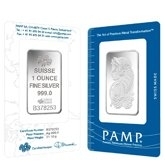 Bullion Exchanges offers you PAMP Suisse silver bars of various sizes, from just a few grams up to 100-ounce bars, along with any sizes that come in this range. Each bar is housed in an assay card in order to ensure both protection and authenticity of the silver bars packaged inside. 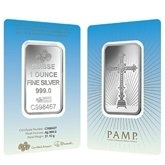 For large ounce and gram-sized PAMP Suisse silver bars, the card is also provided, although it’s not attached physically to the bar like for smaller sizes. For any questions on PAMP Suisse Silver Bars, contact Bullion Exchanges at 1-800-852-6884, or connect with us via our live web chat.